Saudi Arabia has just severed diplomatic ties with the US over the failure of the American war machine to follow through on an intended attack on Syria. This is not an isolated incident, but part of a long history of manipulation of US foreign policy by Middle Eastern power players. One of the most powerful and mysterious of these players is Saudi Prince Bandar bin Sultan. Bandar is known to the politically savvy as a member of the "BBB" axis driving the recent unrest in the region. "BBB" stands for Barack Obama, Bibi Netanyahu, and Bandar bin Sultan. Bandar's influence stretches back a bit further in recent history: he was known to be so close to America's Bush political dynasty that political commentators jokingly referred to him as "Bandar Bush". Some believe him to be the architect of many or all of the region's recent political upsets. Pallas/Ethics: Bandar is not completely without an ethical awareness: Pallas is trine Mercury and square the Sun. The good news ends there: Pallas is the crux of a sesquiquadrate-yod between Jupiter and the South Node (two of the three astrological factors which block her). Pallas' ruler Mercury is opposite Pluto (the third negative factor) and on top of this, Mercury is trine the South Node. Put a person with this configuration in a position of power, and bad things will probably happen to the powerless. Venus/Economics: Bandar's chart suggests that he has almost no respect for the concept of private property. Neptune is sesquiquadrate Venus here. Venus' co-ruler Uranus is trine the South Node and co-ruler Saturn is semisquare Neptune. This is only slightly mitigated by Saturn widely trine the North Node. Even the Saturn-Venus opposition moves him slightly more to the economic Left. With the debilitated Pallas, we now get someone with no objection to using force or fraud to steal wealth from others. Moon/Culture: Even without a time of birth, we can guess that the Moon is opposite Neptune in all likelihood. On top of this, the Moon's ruler Mars is tightly quincunx Neptune. So we probably have a cultural Leftist, or someone with no desire to preserve culture. Bloodbath Formula: For natives who are responsible for large numbers of pointless deaths, we will almost always see Left-authoritarian chart features (delineated above) along with connections from Pluto to both Venus and the Sun. Completing the Bloodbath Formula, we have Pluto quincunx the Sun, quincunx Mars (ruler of the Moon), and quindecile Venus. 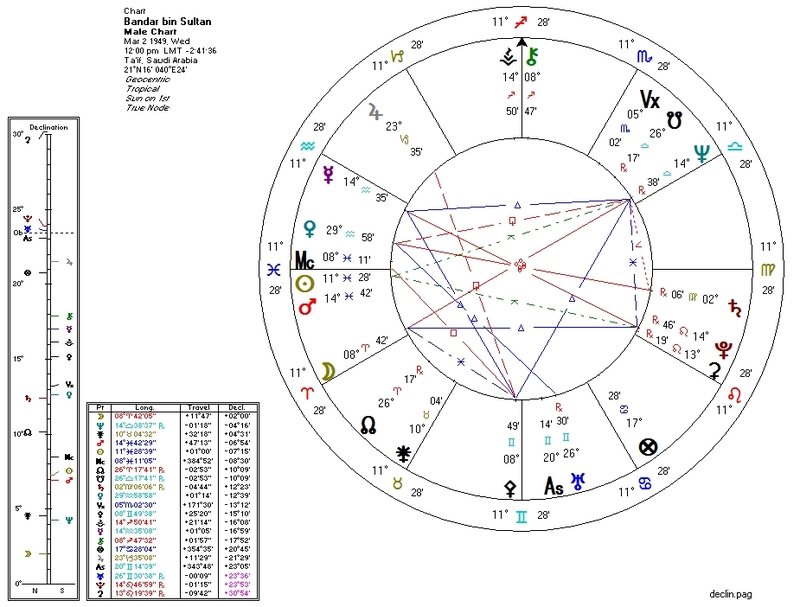 Mars yod with Neptune and Pluto: Activity/war regarding power and oil (oil is considered to be ruled by Neptune, but political astrologer Jessica Murray considers Pluto the ruler of oil). Neptune on everything: Neptune aspects everything on this chart but the Nodes and Chiron (there's a wide square with Jupiter). Since Bandar probably isn't a mystic or an artist, we might guess that his very prominent Neptune manifests itself as deviousness and connection to oil. Hey-- if we're no longer officially friends with the Saudis, can we stop lending them our military?